The Press of Robert LoMascolo: A Short Why on the Long S . . .
A Short Why on the Long S . . . 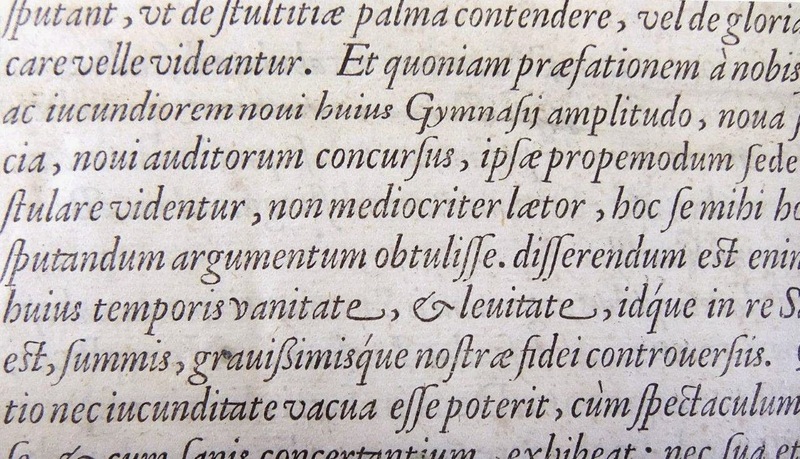 Example of printing from 1591 showing numerous examples of the italic long s.
While discussing the subject of printing history, I sometimes get asked about the letter "f" being used in place of "s." This is actually known as a long s and can be seen in old printed books, manuscripts, and even handwriting. The long s was usually used whenever a lowercase "s" appears in the text and was not at the end of a word. At the end of a word what we would consider the normal "s" was used in most instances, and sometimes within ligatures (joined letters), but not always. The long s looks most like an "f" in Roman types, but the crossbar does not pass all the way through the letter as it does in "f." The ſ seems to have fallen out of favor in print sometime around or before 1800. It sometimes reappears when a time appropriate typographic treatment is wanted, such as in the Bruce Rogers examples below. Here in "Eſſayes" we can see just how much the long s looks like an "f" in Roman type. Indeed this book can be found unfortunately misspelled in many library catalogs. Here in Bruce Rogers' 1927 reprint of "Benjamin Franklin's Proposals for the Education of Youth in Pennsylvania of 1746" we can see that the compositors themselves were not entirely comfortable with the long s, as they mistakenly used an "fi" ligature in place of an "ſi" in "visit." The correct "ſi" ligature is used throughout the rest of the book.